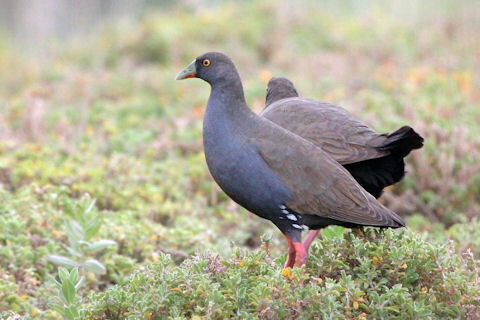 Now what can one say about the black-tailed native hen? Paint Store: "I'd like to get a can of paint in this colour please." - "Yes Sir, that would be our 'intense carmine-pink' but egads sir please take that bird's leg outside!" To continue - there are some curious white spots just above the legs. That's it really. Oh yeah hang on, it's got a black tail.